Simulated DNA sequence haplotype data sets associated with Garrick et al. Extending phylogeography to account for lineage fusion. 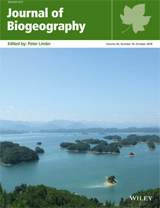 J. Biogeography. Secondary contact between long isolated populations has several possible outcomes. These include the strengthening of preexisting reproductive isolating mechanisms via reinforcement, the emergence of a hybrid lineage that is distinct from its extant parental lineages and which occupies a spatially restricted zone between them, or complete merging of two populations such that parental lineages are no longer extant ("lineage fusion" herein). The latter scenario has rarely been explicitly considered in single-species and comparative phylogeographic studies, yet it has the potential to impact inferences about population history and levels of congruence. In this paper, we explore the idea that insights into past lineage fusion may now be possible, owing to the advent of next-generation sequencing. Using simulated DNA sequence haplotype datasets (i.e., loci with alleles comprised of a set of linked nucleotide polymorphisms), we examined basic requirements (number of loci and individuals sampled) for identifying cases when a present-day panmictic population is the product of lineage fusion, using an exemplar statistical framework—approximate Bayesian computation. We found that with approximately 100 phased haplotype loci (400 bp) and modest sample sizes of individuals (10 per population), lineage fusion can be detected under rather challenging scenarios. This included some scenarios where reticulation was fully contained within a Last Glacial Maximum timeframe, provided that mixing was symmetrical, ancestral gene pools were moderately to deeply diverged, and the lag time between the fusion event and gene pool sampling was relatively short. However, the more realistic case of asymmetrical mixing is not prohibitive if additional genetic data (e.g., 400 loci) are available. Notwithstanding some simplifying assumptions of our simulations and the knowledge gaps that remain about the circumstances under which lineage fusion is potentially detectable, we suggest that the recent release from data limitation allows phylogeographers to expand the scope of inferences about long-term population history.